Good morning! Wouldn’t you like to wake up to this homemade breakfast? Cut the bread into 1 inch cubes. In a large bowl, whisk the eggs, milk, sugar, vanilla and salt together. Stir in the bread cubes and let sit for 5 minutes to absorb. Preheat the oven for 350°. In a small sauce pan, combine the berries, maple syrup and cinnamon over medium heat. Bring to a boil and simmer for 5 minutes, stirring constantly. Stir in the cornstarch and simmer for 1 minute. The syrup should start to thicken. Divide the bread cubes in a 12-count muffin tin. Bake for approximately 22 minutes, until they are golden on top and the egg has set. 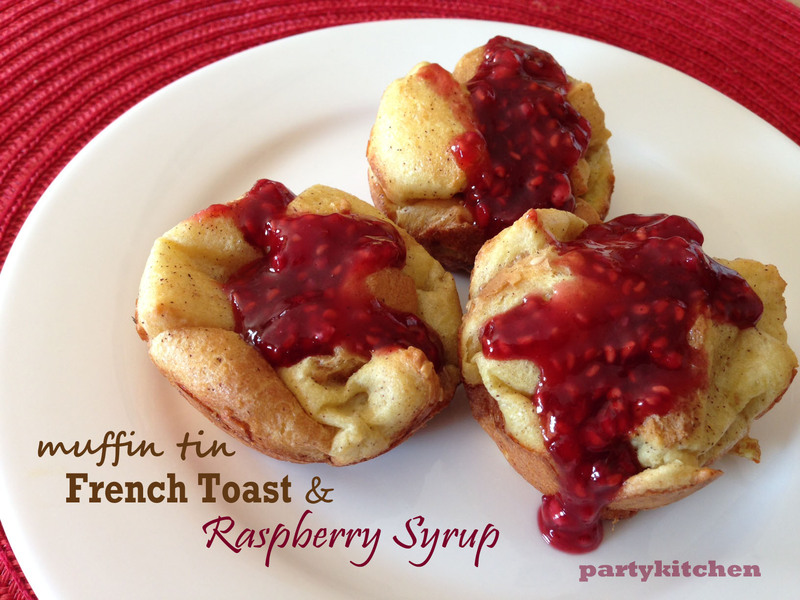 Serve warm with the berry syrup on top. 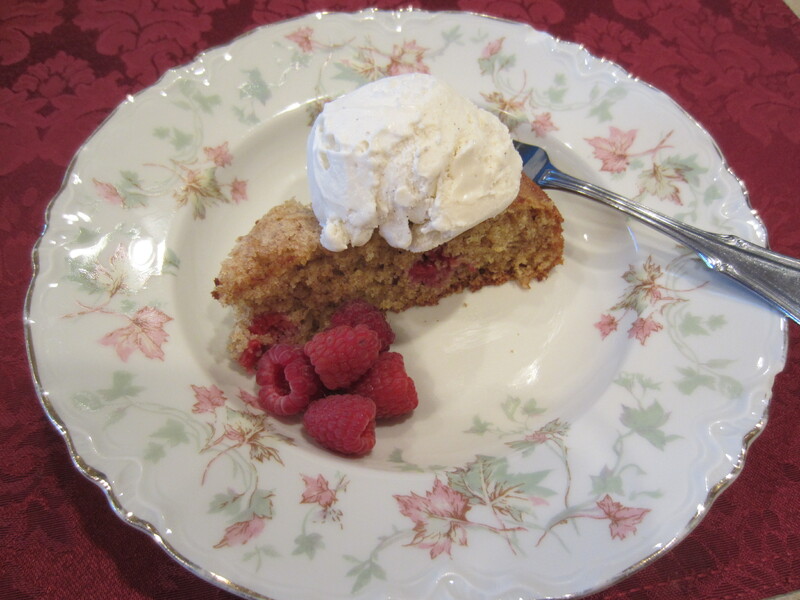 Healthy Raspberry Cake? Why Yes! My family and I had a relaxing afternoon picking raspberries at a local farm on Labor Day. It was definitely the peak picking time for the season after the heat and rain last week. The berries were so big and delicious! When we got home it was about time to start planning a BBQ dinner, but I wanted to whip up a quick dessert with our fresh picked berries. 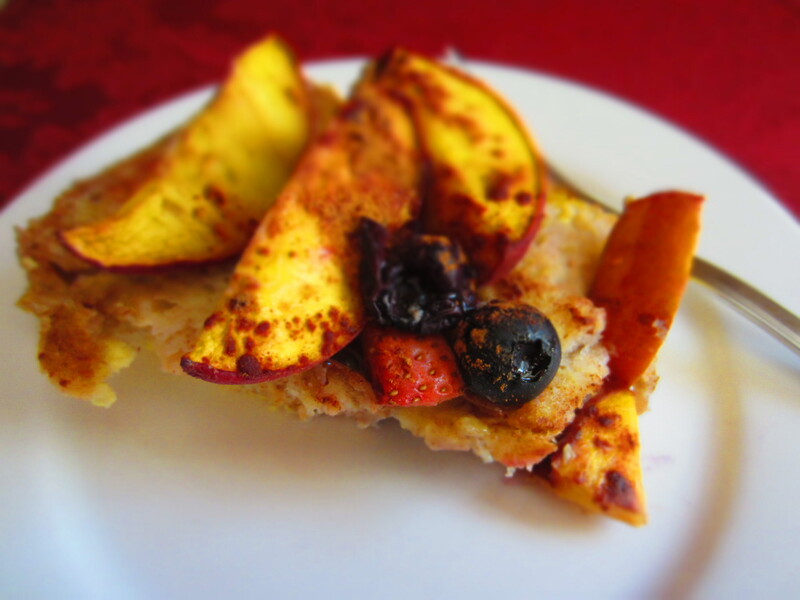 I remembered that I had received a message last week from the Meal Makeover Moms about a healthy cake with fresh fruit. Yes, I said it…healthy cake! Well, I was actually missing one main ingredient. I thought I had wheat germ in my fridge, but as it turned out I didn’t. Since I needed a 1/4 C of something, I added another whole grain – corn meal. Which I really enjoyed the moist cake with a little added crunch. Preheat the oven to 400°. Coat a 9″ round cake pan with cooking spray. Add the dry ingredients in a medium size mixing bowl. In another mixing bowl, whisk the egg, sugar, canola oil, milk, lemon juice and vanilla extract until combined. Add the wet ingredients over the dry ingredients and mix until just combined. Pour the mixture into the pan and place the fresh fruit on top. Sprinkle the top with remaining tablespoon of sugar. Bake for 20-22 minutes until a toothpick come out clean. Let cake cool or serve warm. A scoop of ice cream or frozen yogurt is certainly a treat over the warm cake! Homemade breakfast in a pinch? You got it. This is a quick recipe that can be prepared and baked ahead of time. Store it in the refrigerator for days to come. Then, when you are in a rush…heat it and savor homemade comfort food before you head out the door. This recipe is so versatile because you can easily change up the ingredients and never get tired of it. This time I made it with a combination of banana and farm fresh raspberries that we hand picked at a local farm and froze. My kids were pretty excited to find that they made it into their breakfast! 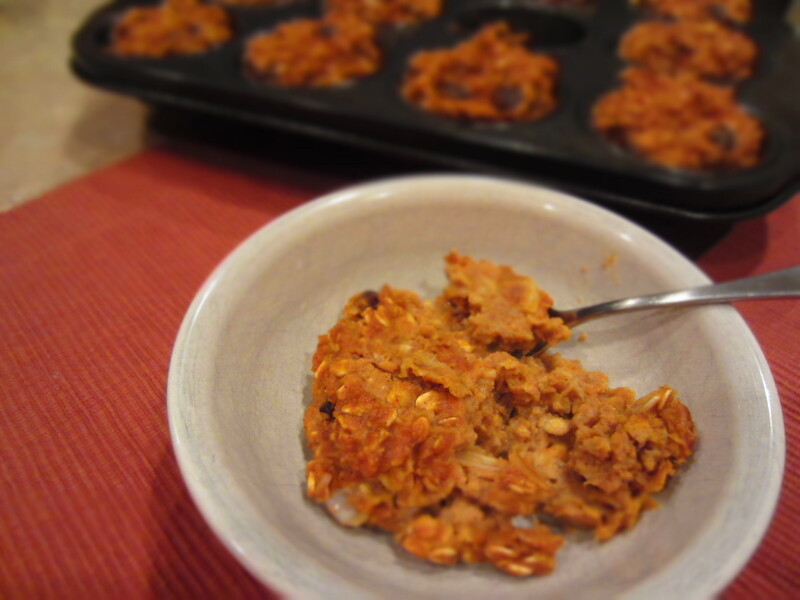 Baked oatmeal can be baked in a pan, but I really like to place the oatmeal batter in a muffin tin to create individual helping. Plus, it makes them easy to refrigerate and you have instant breakfast for the next few days. Preheat oven to 350° and grease a 12 count muffin tin. 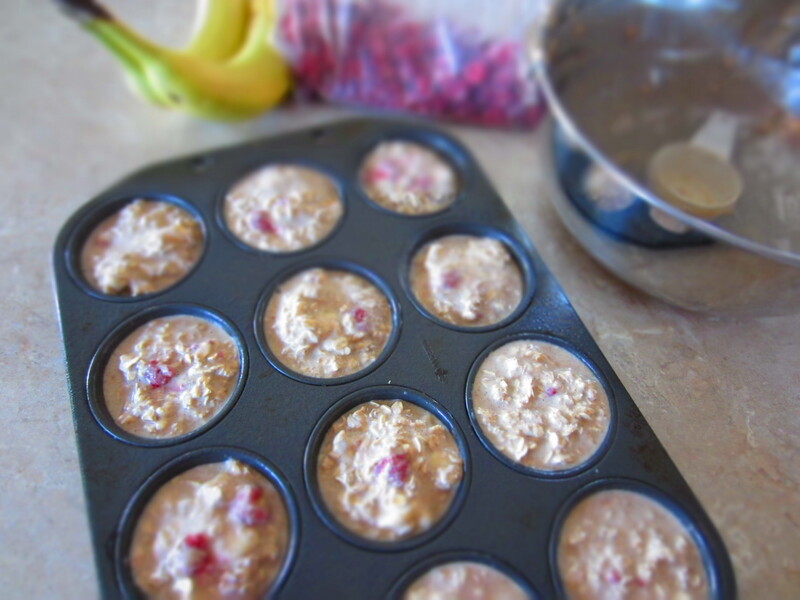 Mix all ingredients together and fill each muffin cup to the brim. Bake for 30 minutes. 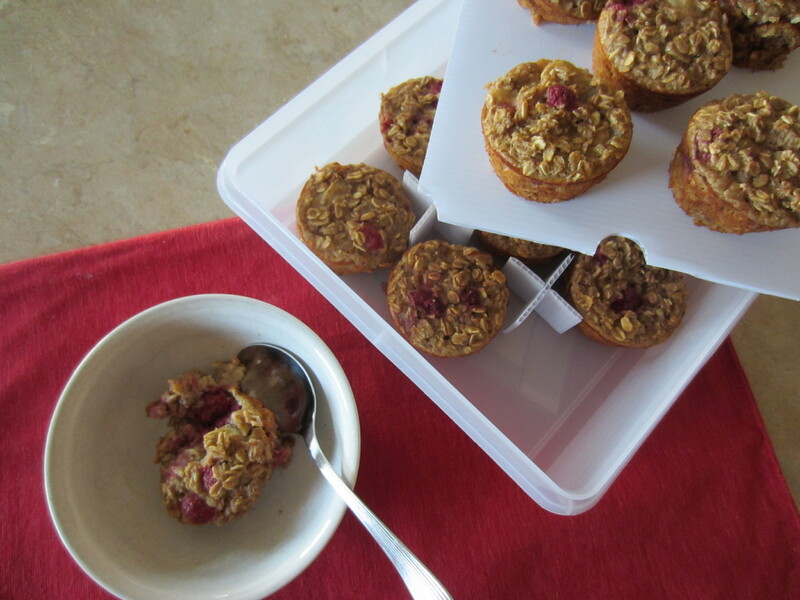 Remove a warm muffin from the tin and drizzle a bit of milk over each baked oatmeal muffin. Comforting and Delicious! Sweet Stackers allow you to separate and stack foods in two or three layers in one container. 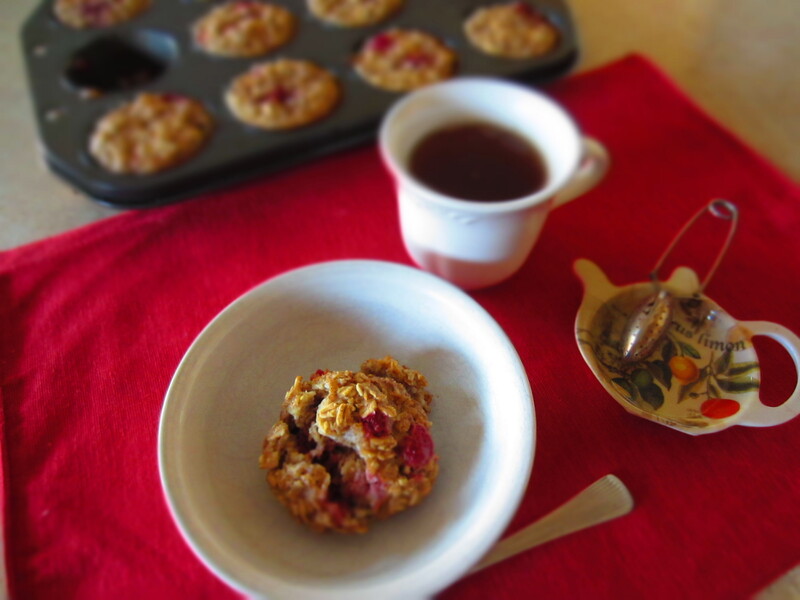 The baked oatmeal muffins fits perfectly in two layers without them sticking together. The trays separate everything in 2 or 3 layers from Christmas cookies to left-over pizza without a sticky mess. Visit sweetstackers.com for more information and ideas of the many uses for Sweet Stackers. 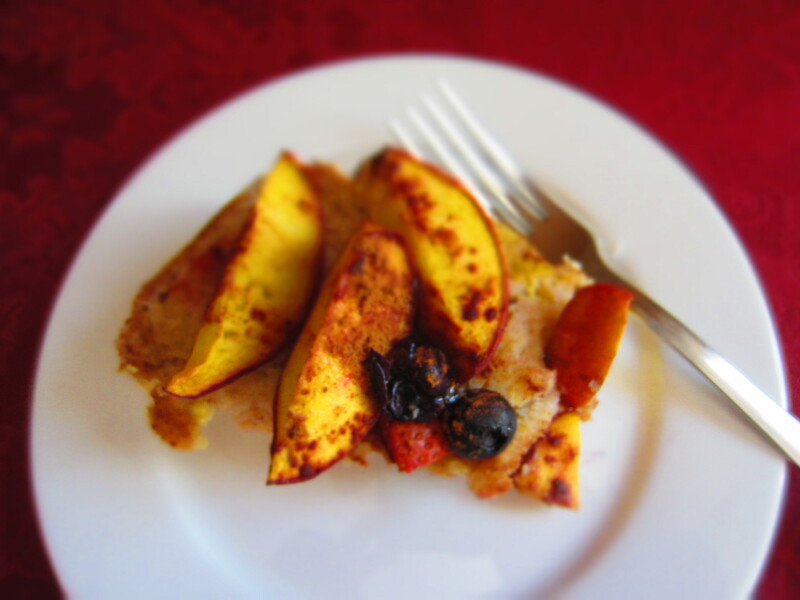 I was on the hunt for a healthy French toast casserole recipe since we were having guests spend the night. A breakfast casserole is great because it can be prepared ahead of time and I could actually enjoy my time with them in the morning. This recipe stood out right away because it was covered with fresh fruit and needed to be refrigerated overnight. 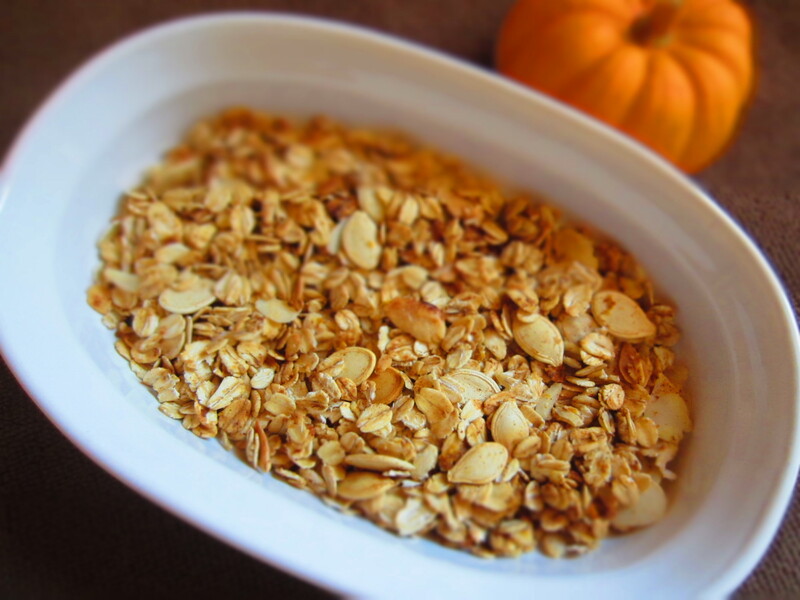 A perfect summer breakfast recipe…or really any time of year! Cut entire baguette into half inch slice and place at the bottom of a greased 9×13 casserole dish. Whisk 8 eggs, milk and vanilla into a medium-sized bowl. Pour the egg mixture over the bread. Toss fruit with lemon juice and 1 tablespoon of brown sugar. Layer the fruit over the bread and egg mixture. Sprinkle the remaining two tablespoons of brown sugar over the top and sprinkle cinnamon. Cover with plastic wrap and refrigerate overnight. Bake in a 350 degree oven for 40 minutes. Top with maple syrup or yogurt. 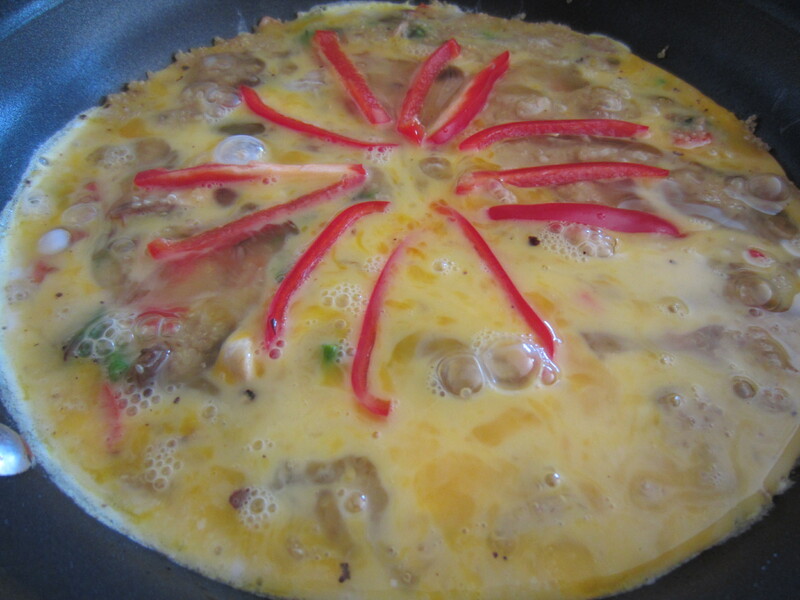 Frittata is an Italian egg-based dish similar to an omelette or crustless quiche, enriched with additional ingredients such as meats, cheese, vegetables or pasta. It may be flavored with herbs. 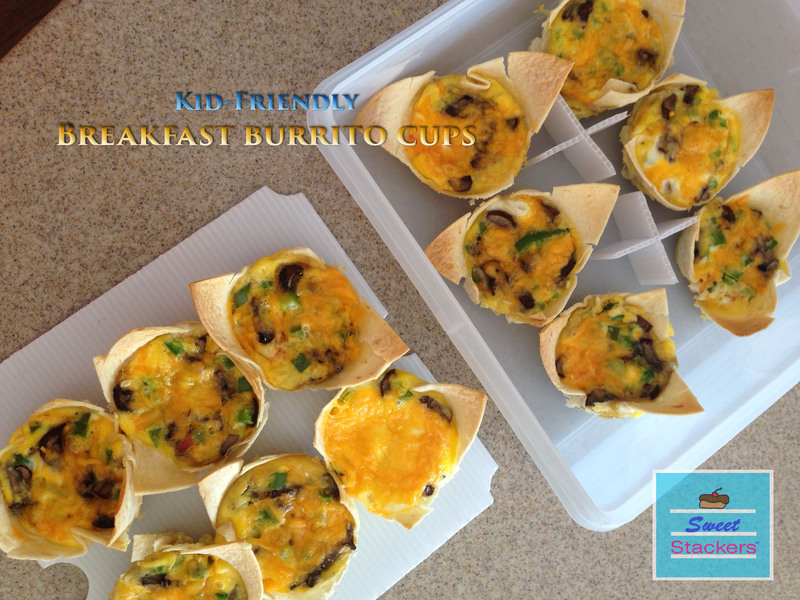 They are so versatile that I never make them the same way twice and they are perfect for breakfast, lunch or dinner. It is a great way to get more veggies into my family’s diet and everyone in my house is pretty happy when I make them. The kids especially like a slice with a little ketchup drizzled on top. Pre-cook 1/3 cup of quinoa in 1/3 cup of water for 15 minutes until the water is absorbed. Set aside. 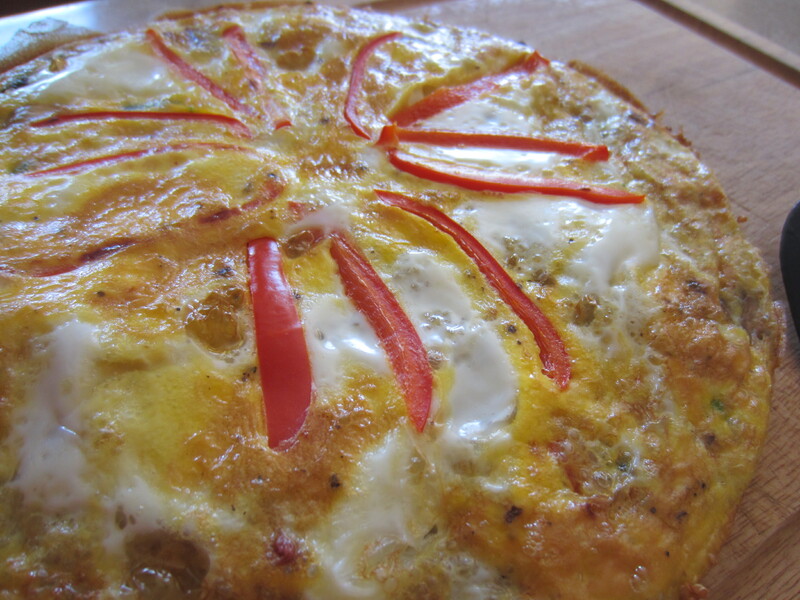 This frittata was a veggie version. But, sometimes I check out my fridge to see if there is any leftover ham, chicken or pork. 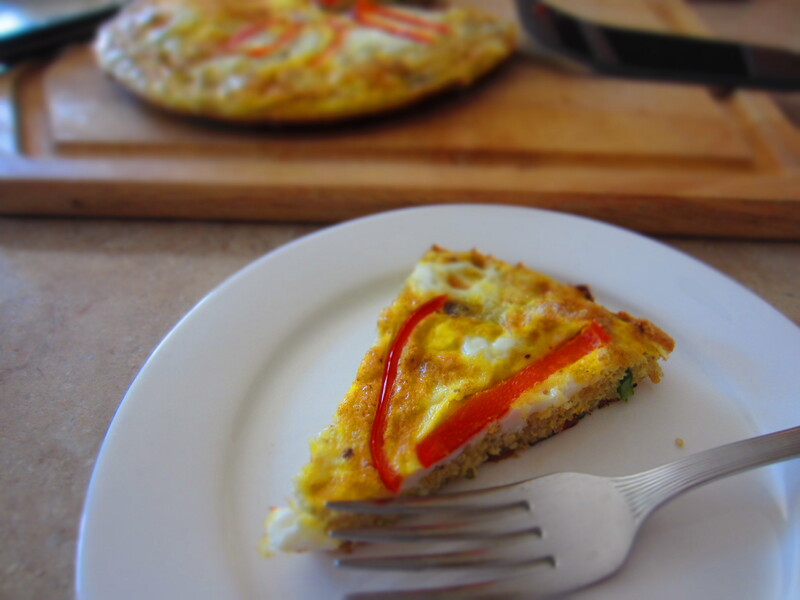 Any leftover meat or veggies are perfect for a frittata!! Cube it and throw that in too. 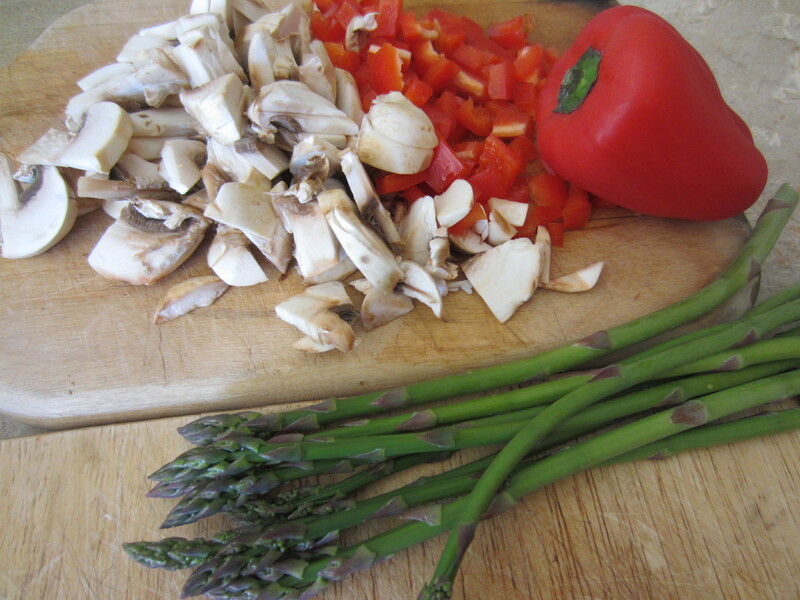 Otherwise, pick any veggies that you have on hand and chop them. I was pretty excited that I was able to harvest my first batch of asparagus from the garden today. Since it is a small handful, it will not be enough to serve for dinner, so into my frittata it goes!! Use a medium-sized fry pan that can be placed in the oven, under a broiler. 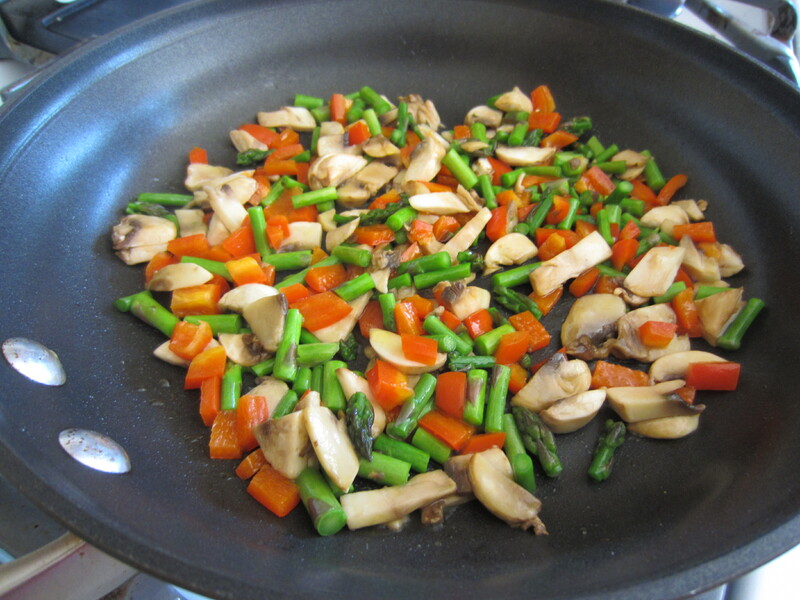 Sautee the veggies in a tablespoon of extra-virgin olive oil until softened. 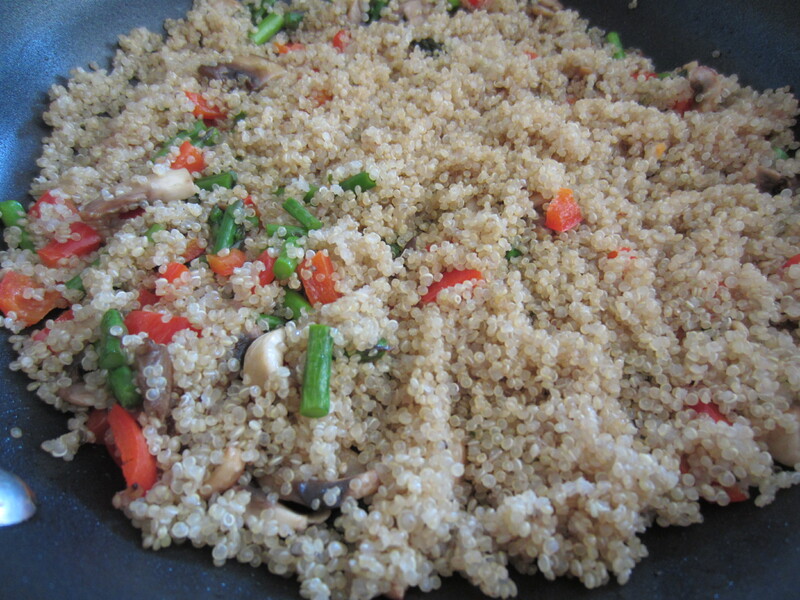 Once the veggies are done, spread them out evenly in the fry pan and place the cooked quinoa on top. Quinoa is perfect because it will settle to the bottom of the dish and give it some crunch, almost like a crust. This is the perfect time to add leftover meat. Wisk 5 eggs in a small mixing bowl and season with salt and pepper to taste. Gently pour the eggs over the veggies and quinoa evenly. I strategically placed a few slices of sweet baby red peppers to fancy it up. This is the perfect time to sprinkle a little shredded cheese or grated parmesan if you’d like. Cook over medium heat until the eggs are almost completely set. To finish cooking the eggs, I place it under a broiler a few minutes until the top is cooked and golden brown. 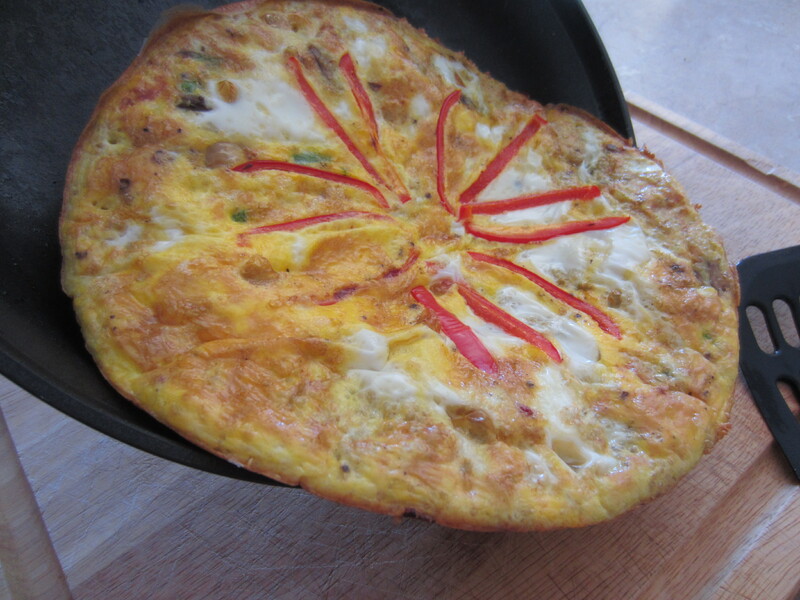 Slide the frittata out of the pan and cut into wedges to serve. Always looking for healthy snacks that you can take on the go? Of course you can purchase granola bars at the grocery store, but the ones my kids like are not really a healthy snack and they make me more hungry after eating just one. Some of the healthier versions are difficult to bite and chew, plus pretty pricey. So I thought I would try to make my own. I had all of the ingredients in my pantry, they were easy and my 3-year-old had a lot of fun measuring and mixing the ingredients. 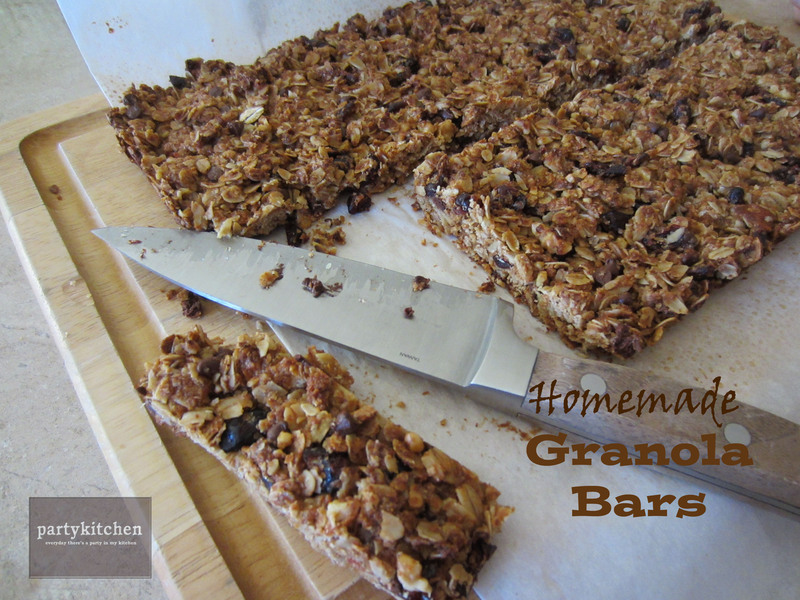 This recipe turned out perfectly delicious for both kids and adults alike! Mmmmm! Chewy, with lots of flavor and texture and I know I was fully satisfied with eating only one bar. Mix all dry ingredients in a large bowl. Combine egg whites, honey, maple syrup and oil in a medium size bowl. Fold the dry ingredients with the wet ingredients. Line a 9×13 inch pan with foil or parchment paper. Lightly oil the pan so the bars will not stick and can be removed easily. Press the mixture evenly into the pan. Bake for 30-35 minutes until lightly browned. Cool in pan for 1 to 2 hours. Remove from pan and cut into bars. I divided by cutting down the center lengthwise and then cut approximately 1 inch bars from the two halves. Last night, I had guests stay the night and needed a quick breakfast to serve in the morning before they headed out. In the afternoon I quickly whipped up this recipe and placed it in the refrigerator until morning. 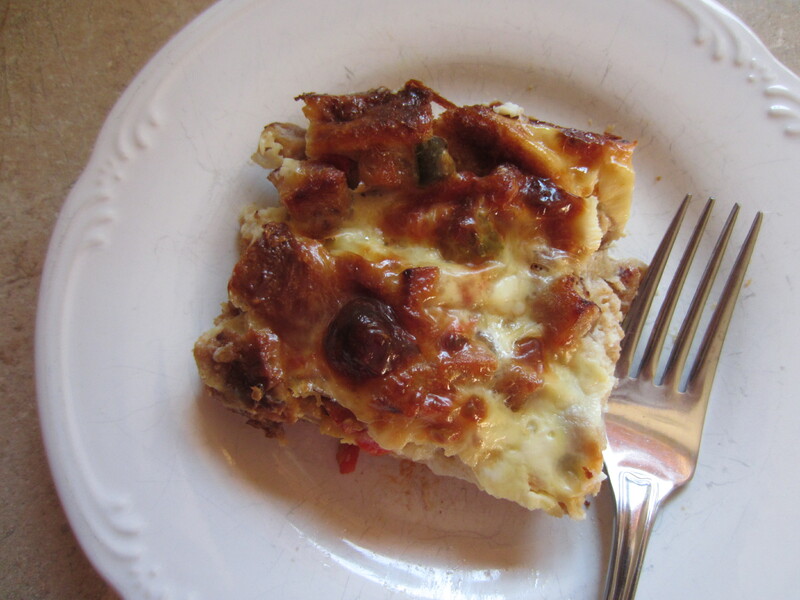 There are a ton of breakfast casserole recipes out there, but I combined a few recipes and made it healthier. I used chicken sausage links instead of pork sausage, added a veggie using sweet red peppers, cut the number of eggs and instead of using half-n-half or cream, substituted the combination of milk and plain yogurt. Plus I used leftover bread and crusts for this recipe which I described in a prior post French Toast Casserole using Leftover Bread. I have been freezing leftover bread by cutting the crusts off of my kids sandwiches and saving the end slices of bread. Layer the bread cubes, chicken sausage, red pepper and cheese in a 9 x 13 baking dish. Lightly beat the eggs, milk and yogurt until combined and pour the mixture over the bread. Cover and refrigerate overnight. Bake 350° for 45 minutes until an inserted knife comes out clean.